US Hawks Hang Gliding Association • View topic - Applause for Wills Wing! In the early days of the rapid growth of paragliding Wills Wing looked into expanding into manufacturing paragliders. I don't know any of the details of this except that they decided not to get into that market. Considering their success in staying alive in a shrinking hang glider market I think they would have become one of the "big guys" in the paraglider market. Kudos to them for whatever the reasons behind that decision, I see it as a correct decision against corporate growth and profit in favor of public safety. So, I hereby give a big round of applause to the folks at Wills Wing for making that decision so long ago. Keep on building those great airworthy gliders, guys and gals! Re: Applause for Wills Wing! I agree with you. The Condor is the closest thing to a paraglider with bones, but is not certified for high flights. So, Steve Pearson and Mike Meier, the boys from Wills Wing, specifically make a Hang Glider for Paraglider People. It is called the Wills Wing Alpha and comes in two sizes, 180 and 210. They are BBWs, Big Beautiful Wings. I can’t imagine a glider being easier to fly than a Falcon, but the Alpha is reported to be just that. Any where a paraglider can go, an Alpha can go too and beyond. An Alpha is an easy 100+ mile glider. "He was at a height of between 1,000 and 1,500 feet when the lines connecting him to the parachute-like canopy simultaneously broke, detaching him." Wheelock's wife, suddenly widowed with three children, immediately sued the distributor of the paraglider, Sport Kites [Wills Wing], and president Rob Kells for negligence. After a series of legal actions continuing over years and culminating in a revised Hawaiian statute which voided all extreme sport waivers and required a jury trial for every negligence claim, Wills Wing ceased distribution of paragliders in April of 2007. Yeah. Wills Wing saw where this was headed and got out of paragliding before it ruined them. Thank God! Thanks for the details, Rick. It's amazing that all of the lines broke. Once a few of them went it should have mostly unloaded the remaining lines as the paraglider and pilot fell. And a second applause for Wills Wing decision! To Magneta Bluesky: I was flying an Alpha 210 but once I bought the 2 Condors: 330 & 225, I no longer had a need for the Alpha since the 225 Condor would fill my need for it with the flying I intend to do. Now Joe Faust is setting "number of flights in a day" records with my former Alpha 210. It's in good hands. But I can't understand how at least one of their paragliders was so defective. 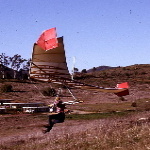 As I recall things Wills Wing did not make their own canopies (while they do make every hang glider they sell!). So, somehow quality control was lacking with their PG manufacturer. But I wonder if Wills Wing personnel inspected each of the incoming products? BTW - Back in '89 or '90 at the Telluride meet the Wills Wing Team all(?) flew PGs. I was a bit disappointed by that, but at least none of their canopies collapsed or otherwise failed on them. I guess my applause would be for them not just deciding to make the pilot connections stronger, so that it couldn't happen again, and continue in the PG business. i think they must have also been becoming aware of the inherent flaw in the aircraft's basic design. Unable to hold necessary wing shape in zero or negative weight loading conditions which can be caused by (normal) atmospheric turbulence or pilot aerobatics. The whole WW team flying PG's at To-Hell-you Ride was an obvious big promotion of their new product line. I'm glad there were no serious accidents for them. Some things definitely changed in their thinking after that.